Qualcomm surprised me this evening at the Pepcom event; they had their new business partner in the booth and a couple Bambook Sunflower units on display. Qualcomm just announced the Sunflower this morning, and I wasn't expecting to see it until CES officially opened. BTW, The Verge has already posted a video and a brief hands on post; they reached pretty much the same opinion I did. The screen and device simply aren't there yet. Speaking of the device, I carefully compared my unit to the Sunflower demo unit. That one looked to be a commercial model, not pre-production, and it had virtually the same screen as mine. The difference was close enough that I'm willing to write it off as the screen on my unit being dirty. But that unfortunately means that my impressions weren't affected by a freakishly bad screen; they're all like that. I didn't get a chance to ask everything (he kept getting pulled away, too), but I did pick up a few important details about the Sunflower. 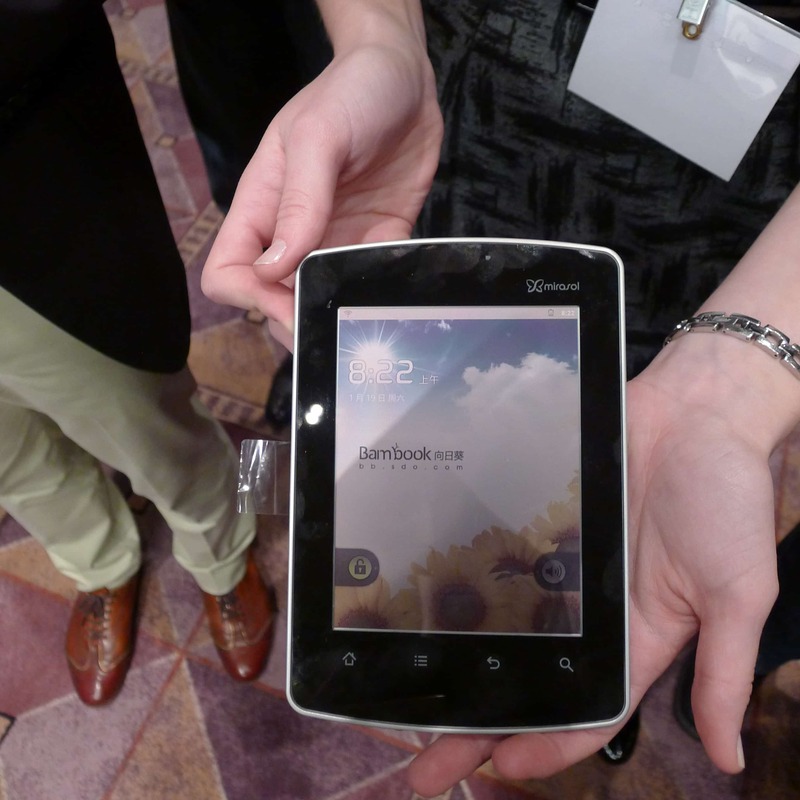 First, it's going to be able to do more than the Kyobo eReader when it ships in February. Shanda is planning to have more Android like abilities, and the demo unit I saw even had a bunch of apps. But I'm not sure which ones; the menus were in Chinese and I wasn't allowed to change it to English. But it's still going to be tied to Shanda. I pestered them about apps from elsewhere, and I was told that Shanda has over 40 thousand Android apps in their store, so there's no need. And the same goes for the ebooks and graphic novels. The Bambook Sunflower uses a reading app that supports Shanda's proprietary formats, but I'm not sure what format that is or what other formats are supported. I tried to ask, but language difficulties got in the way. In any case, the apps will be coming later. I was told that the Bambook Sunflower will first be focused on the reading experience, and that Shanda will support it with an ebookstore that has several million ebooks as well as 20 thousand digital graphic novels. But it's still going to be locked down. That is frustrating, especially when the device costs nearly as much as an iPad. P.S. Here is a gallery of photos. They're the original shots, and most are quite large. >>>The Bambook Sunflower uses a reading app that supports Shanda’s proprietary formats, but I’m not sure what format that is. Ask frikkin Qualcomm. All of this now sounds like their doing.